For nearly five decades, Earth, Wind & Fire has been keeping it funky. The R&B institution boasts eight double platinum albums, two No. 1 hits — “Shining Star” and “Let’s Groove” — 17 Grammy nominations, and it has sold more than 100 million records. This classic group of rock-and-roll Hall of Famers is bringing its iconic horn-driven sound to the Iowa State Fair Grandstand on Aug. 16. Verdine White plays bass, sings, and, of course, dances in unison with his fellow bandmates. He is one of three remaining original band members, along with Philip Bailey and Ralph Johnson. CITYVIEW caught up with White, and he explained why his band has endured through the decades. He credits his late brother, Maurice White (who passed away in 2016) for first putting the band together in 1969. “We wouldn’t be talking today, and we wouldn’t have this band today, if it wasn’t for my late brother Maurice,” he says. The band recently finished a stint at the Venetian in Las Vegas and performed at the Bottle Rock Festival in Napa Valley, where they were on the same billing as Bruno Mars. White says the group appeals to all ages and types of fans. “The festival in Napa with Bruno Mars shows that young people like watching all genres of music together,” he says. White embraces his fans and keeps them updated on Instagram, Twitter and Facebook. EWF recently returned from a European tour where fans in Paris were eager for photos together. Fans often approach, offering praise. White takes it in stride, staying humble. He appreciates that fans appreciate the music. The band has performed at the White House for both Bill Clinton and Barack Obama, earned a star on the Hollywood Walk of Fame and won Grammy Awards. With so many awards and honors, there isn’t any one event that stands above the rest. 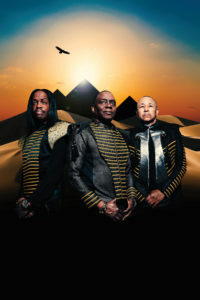 At the upcoming concert, Earth, Wind & Fire will play melodic tunes, such as “Sing a Song” and “September.” White says the group’s music hasn’t changed much through the years.